A dental implant is a surgically inserted post that attaches to your underlying jawbone and helps to support your facial structure by applying a healthy amount of pressure. This, in turn, ensures that your jawbone will continue to produce new, healthy bone cells. Each part of the implant process plays an integral role in fully restoring the function of your teeth, maintaining your oral health and enhancing your appearance. Usually made from high-grade titanium, the post inserts into and eventually fuses with your underlying jawbone to form a sturdy foundation. The success of this procedure is largely based on titanium being biocompatible and generally causing few allergic reactions when inserted. After an initial phase of healing, an abutment is attached to the implant. It serves as a connecting piece that allows a fixture to be securely fitted to the implant. Usually, it will be made from titanium as well to ensure the most secure and lasting fit. Crown – If you have a single tooth missing, a crown will be used to cap your implant and fully restore the function of the tooth. Made from tooth-colored porcelain, it also offers aesthetic benefits. 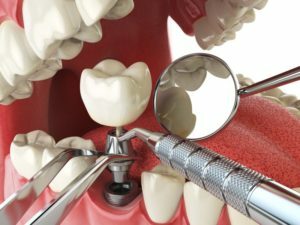 Bridge – If you have more than one tooth missing, consecutively, your dentist may fit you with a bridge, which is a series of porcelain prosthetics made into one fixture. By attaching to an implant, it will help to provide a level of support that’s only rivaled by your natural teeth. Implant-Retained Dentures – Instead of sitting on top of your gums the way traditional prosthetics do, implant-retained dentures securely fasten to your implants using either snaps or a bar to hold them in place. Patients who have this procedure done won’t have to worry about their appliances slipping or falling out of their mouths. Once the permanent fixture is placed, you’ll be able to again enjoy the quality of life you once had. You’ll be able to eat the foods you had to give up, speak clearly and smile with confidence. To learn more about the process, reach out to your local dentist to schedule a consultation today. Dr. Scott Wehrkamp earned his dental degree from Loyola University Chicago School of Dentistry and has been practicing privately for nearly 40 years. He specializes in implant surgery for single tooth and full-mouth reconstruction and is a member of the International Congress of Oral Implantologists. Dr. Wehrkamp helps patients regain the lives they once had at Wehrkamp Dentistry and can be reached for more information through his website.